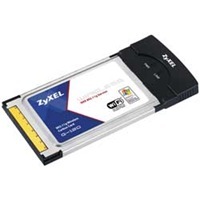 Compatible with the IEEE 802.11g/11b standard, ZyXEL wireless cards provide users with data rates up to 54Mbps; 5 times faster than 802.11b standard. For PCs to share network resources and/or Internet access without connecting with an Ethernet cable, install a wireless client adaptor in each PC. Depending on the type of interface available, you can choose from USB, PCMCIA/Cardbus or PCI wireless client adaptors. It’s based on the ZD1212B USB wireless chipset.